Delivery Policies | Capitol Supplies, Inc.
Orders may be called in to our customer service center between the hours of 7:30 AM and 5:00 PM Monday thru Friday. (8:00 AM to 12:00 Noon Saturday). Orders may be set for either Will Call or Delivery. Will Call/Pickup Orders called in for Pick-Up will be given a high priority to be pulled before you arrive. When possible, try to give as much time as possible for us to get the order ready. Our goal is to have you out our door 10 minutes after you arrive, if you call your order in at least one hour prior to your arrival. Orders placed upon arrival will be pulled in a quick and speedy fashion. We ask that you have your orders faxed or phoned in no later than 4:00pm the day before shipment. Please have your orders faxed or phoned in no later than 11:00am the day of delivery. We offer delivery to your area on certain days. Please review the schedule listed below for your areas coverage. We ask that you have all of your orders faxed or phoned in no later than 8:30am for delivery that day. 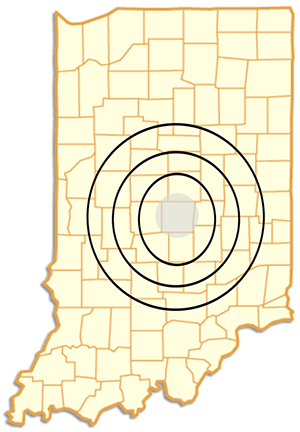 Job site deliveries to Marion county and surrounding counties can be made every day. Please have your order called in by 4:00pm the day before shipment. Please provide us with detailed directions and an address. Minimum order amount for job site deliveries is $250.00. We can allow a maximum of 1 hour of unloading time. Items that are shipping via UPS need to be called in by 1:00pm for same day shipping from our warehouse. We reserve the right to ship small orders via UPS, rather than on our truck.